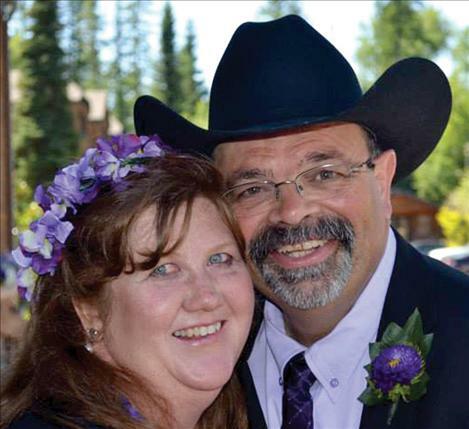 WHITEFISH — Melanie Good of Pablo and Tim Fox of Lander, Wyoming, were united in marriage on July 7, 2014. The service was officiated by Reverend Brenda Solar. The maid of honor Callie Simons from Madera, California, and best man Reverend David Solar from Warroad, Minnesota, attended the private ceremony held at Grouse Mountain Lodge in Whitefish. The reception was held at Mike and Nancy Meuli’s ranch in Dayton. Tim and Melanie met on Memorial Day 2013 at the home of a mutual friend. A year of a “Lord appointed” courtship ensued marked by a growing friendship that deepened over time. While standing in the prayer line at Bethel, following the conclusion of a week-long healing conference, Tim proposed and Melanie accepted, resulting in the perfect conclusion to an amazing month-long road trip visiting friends in several states and enjoying the Pacific Ocean. Melanie was married for thirty years prior to her husband filing for divorce in 2008. She has been employed by St. Luke’s Hospital for the past seven years and has been a resident of the Mission Valley since 1977. Tim was married for almost 38 years prior to his wife’s death due to cancer. Tim is an ordained minister recently retired from pastoral ministry after thirty-two years of ministry. The couple believes that God has called them to marriage ministry and plan to facilitate “Love After Marriage” workshops following certification. They currently worship at Fresh Life Church in Kalispell. Tim and Melanie are blessed with seven children and nine grandchildren. They currently reside at their home in Pablo and are very thankful for all who have blessed their marriage.